I am also going to be participating in the 10 in '10 Chick Lit Challenge hosted by Kay Cassidy and Jessica from Chick Lit Teens. I hope to read more than 10. Here is the info. 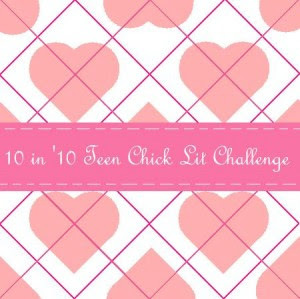 1) Grab the official 10 in ‘10 Teen Chick Lit Challenge logo above and put it on your site with a link back to this page to let people know you’re playing. 3) Click on the Mr. Linky button below to share your list if you’ve posted it on your blog. If you don’t have a blog, simply comment below with your choice of books and let us know you’re in like Flynn. 4) Each month, Jessica and Kay will alternate hosting the official check-in post where you can share the books you’ve read for the challenge. And be sure to let us know what you thought of them! Hoàng Quân đem đến cho quý khách các dịch vụ thue xe tốt nhất http://thuexe16chorenhat.com, http://thuexedulich29cho.com/ uy tín nhat Ha Noi.